An earthquake with a preliminary magnitude of 4.1 rattled the South Bay on Monday, according to the U.S. Geological Society. Ian Cull and Jeff Ranieri report. An earthquake with a preliminary magnitude of 4.1 rattled the South Bay on Monday evening, according to the U.S. Geological Society. 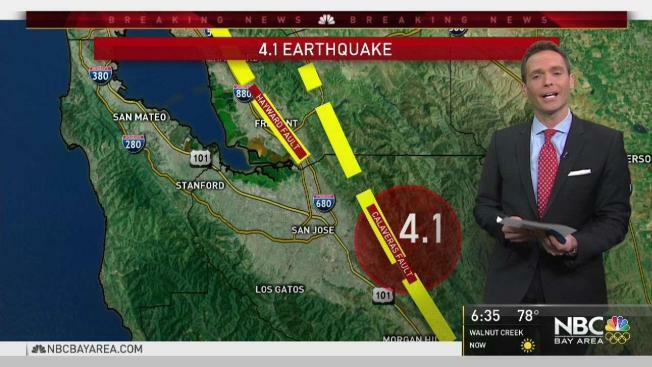 The temblor hit about 5:55 p.m. and was centered about 8 miles east-southeast of the Alum Rock area of San Jose, the USGS said. The quake struck on the Calaveras Fault and had a relatively shallow depth of about 5 miles, the agency said.